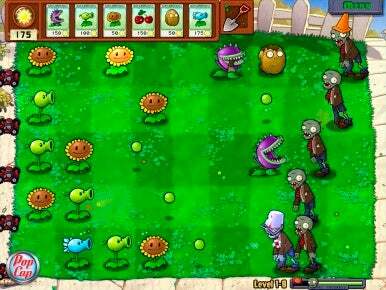 PopCap Games on Tuesday announced the release of Plants vs. Zombies for the Mac and PC. It’s a new “Zombie Survival” game and it costs $20; a demo is available for download. Vegetation serves as your protection from the undead in this new action/strategy game from the makers of Peggle. A humorous action-strategy game that, despite its somewhat morbid subject matter, is suitable for the whole family, Plants vs. Zombies pits you against hordes of shambling zombies who are trying to trespass on your lawn. Your defense is an army of seedlings; specially-bred plants that offer you offensive and defensive capabilities, such as pea-shooters, mushrooms that blast spores at the zombies, zombie-eating vines, exploding “cherry bombs,” potato mines and many more. Plants vs. Zombies sports five different play modes — Adventure, Survival, Puzzle, Zen Garden and Mini-Game challenges, with 50 levels in the main Adventure mode and 50 more in the other game modes. There are four dozen different plants you unlock in the course of the game, and dozens of different zombie types ranging from businessmen to football players, miners, and even a zombie bobsled team. Along the way you earn money you can use to spend at your neighbor Crazy Dave’s “trunk-o’-the-car” shop, to purchase “power plants” and zombie-exterminating tools. System requirements call for Mac OS X 10.4.11 or later, 512MB RAM, Intel Core Duo 1.66GHz or faster processor.